Gohl Clinic of Chiropractic in Carlsbad - What is a 14x36 Spinograph? What is a 14×36 Spinograph? The 14×36 in. spinograph is the only x-ray solely created by the chiropractic profession. Medicine does not use them because they are considered non-diognostic films. However, they are supreme when determining the stucuture, the misaligned segment, and how to adjust it. Many believe that these 14×36 spinographs overexpose the patient to x-ray, but this isn’t true. When these pictures are taken, both front and side views are taken in only 3 exposures. 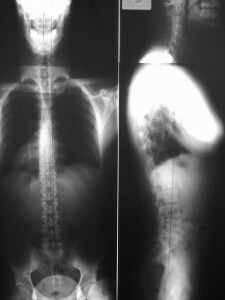 If you want to get the same films using sectional x-rays, you need to get these views: front and side lumbar/pelvis view, front and back thoracic view, front and side neck view, and one open mouth view. That is a total of 7 exposures. Add in a chest view and an L5 spot shot, which are all common, you’re at 9 exposures. Additionally, the x=rays are taken at 84 inches, instead of 40 inches. Doubling the distance decreases dosage. Also, your Carlsbad Chiropractor uses the Larson X-ray Filter System, which covers all radiation-sensitive areas of the body. An x-ray physicist reviewing the filter said that in taking a 14×36 xray, both front and side views, the amount of radiation received is similar to the amount of x-ray received in taking a flight from Omaha to Los Angeles. Gonstead technique is based on the foundation principle. The foundation must be set before the rest of the body will stabilize. If you look at an entire picture of the spine, from the pelvis to the skull, you can see how the body adapts to its structure. A neck misalignment might not be caused in the neck. It could very well be caused by a misaligned pelvis. This is the only advantage that really matters. Since these spinographs are taken 84 inches from the film, the picture is magnified very little and therefore more true to size. The idea of using the spinograph is that it confirms subluxation criteria and creates certainty. No one understands all of the wisdom of the body. It is more evidence I have that allows me to determine the subluxation. Recently I added this video that you man understand more about understanding a spinograph.